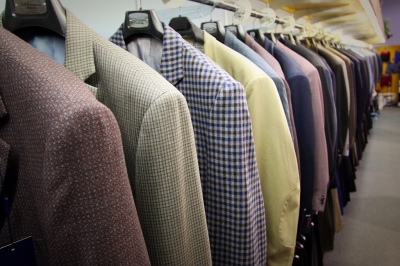 Addetto Men's Wear Kingsize Fashions is located in Edmonton, AB. We offer big and tall suits, xl sizes, and extra tall 42-54. Shirts, suits outerwear, trousers, sleepwear and jeans are just some of the many items we carry in above-average sizes. We have suits from 42 right up to 66. They go from a large tall up to an 8X tall. We want to make it one-stop shopping for larger men. If we can't find it for you our Master Tailor will make it for you. We’ve got fabric swatches and we offer a full measuring, template and fitting service. Our custom services is very popular because we take the business of well-fitted clothing for the larger man seriously. I​​​f we don’t have it in stock we can make it for you. We do alterations. If you have athletic wear from adidas, lululemon or any other company , we have the machines to hem that type of fabric. We now have the equipment to offer custom made buttons for any garment. We specialize in fashion for big and tall men. We make looking good and feeling great a whole lot easier for guys who stand head and shoulders above the rest of the pack. ​Stop in and visit us. You won’t be disappointed.